The foolhardy beware this delicious looking, juicy red berry that I have seen only this week still growing and glowing temptingly from the hedgerow. As sweet and as tempting as these burstingly rotund berries may appear, they are nonetheless quite seriously poisonous, and you will do well to learn them so you may positively avoid. Black Bryony has an unusual growth habit for a berry in that it climbs through the hedgerow like a vine. It weaves its beady tendrils amongst the other plant-life indiscriminately, and may well impose itself amidst a bounteous growth of Haws, Rowan Berries or Rosehips. At this time of year, there isn’t really much that’s edible about that you could confuse Black Bryony with. Having said that, if you have read my most recent post you will realise that the very last Haws of the year may still be clinging to the trees, so do take care if you decide to go out for them. 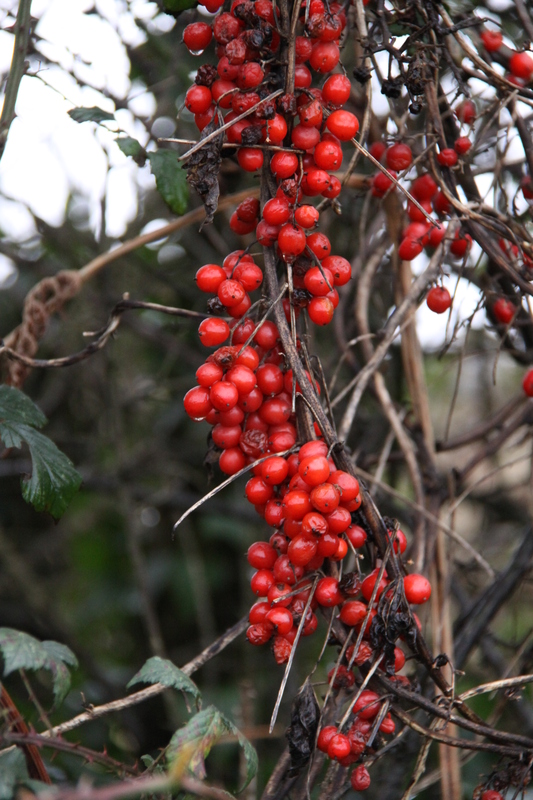 For further pictures and description of this poisonous berry, see my Poisonous Berries A-Z page. This entry was posted in Poisonous Species and tagged Black Bryony, family activities, foraging, free food, Haws, Hawthorn Berries. Bookmark the permalink.